This delicious orecchiette pasta dish is quick and easy to make. A lovely combination of spring greens, traditional Italian pasta and spicy red chili, for a healthy meal that will blow your taste buds! 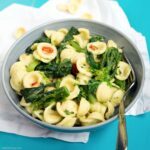 On my last trip to Puglia, a couple of years ago, I finally had the chance to taste one of the traditional recipes, orecchiette with broccoli rabe. It may not ring you a bell, but if you’re Italian or have been to Puglia before, you know that’s an absolute must-try. Simple, satisfying and incredibly tasty, I’ve been craving orecchiette with broccoli rabe ever since then. The great news is, I’ll be heading to Puglia tomorrow and I couldn’t be more excited ( especially if orecchiette are involved)! Thanks to the lovely team at Bertolli, which you know already I’m collaborating with, I’ll be going on a magnificent foodie trip around Puglia and I can’t wait to be back and tell you everything about it. In the meantime, to satisfy my orecchiette cravings, I’ve made a super simplified version of this classic Italian delicacy. Whilst it can be hard to find broccoli rabe (or rapini) to recreate this traditional pasta, you can easily substitute with sprouting broccoli like I did. I’ve also added an unusual ( at least for me) Asian veggie called Choy Sum, very similar in terms of flavors to broccoli rabe. Again, this is totally optional and you can stick to regular broccoli and/or rapini if you prefer. 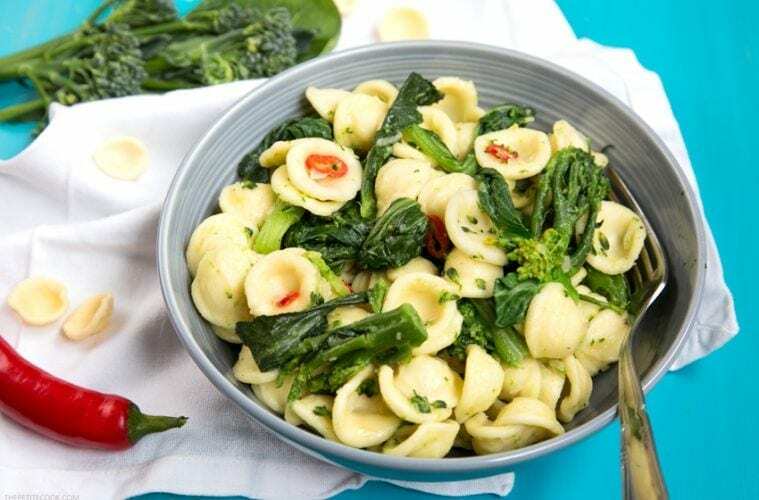 Ready in less than 20 min, these Orecchiette with Sprouting Broccoli and Choy Sum make a speedy and satisfying meal to share with your family on a busy week day. 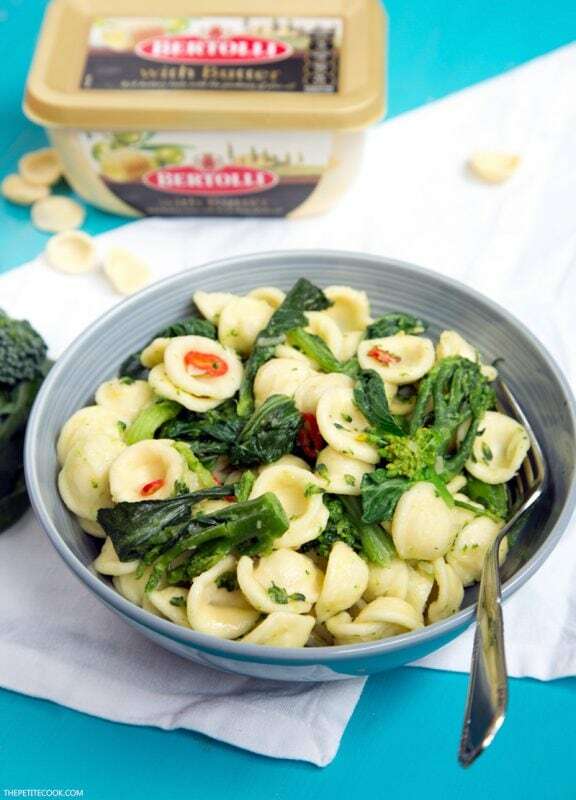 All you need is literally 5 ingredients: orecchiette pasta, a bunch of sprouting broccoli or rapini or choy sum ( just the leaves), shallots, red chili pepper and Bertolli with Butter. If you ask me, the secret ingredient is definitely Bertolli with Butter. I totally loved the luxurious rich and buttery flavor that adds to this classic recipe, bringing it to new different level. 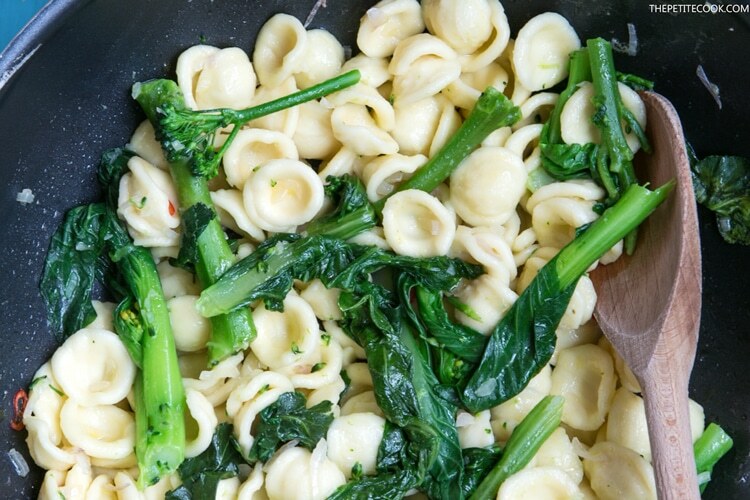 Making these Orecchiette with Sprouting Broccoli and Choy Sum is easier than you think. Start by cooking the pasta and veggies in the same pot. In the meantime, heat a large pan with some Bertolli with Butter and chopped shallots and cook until soften. 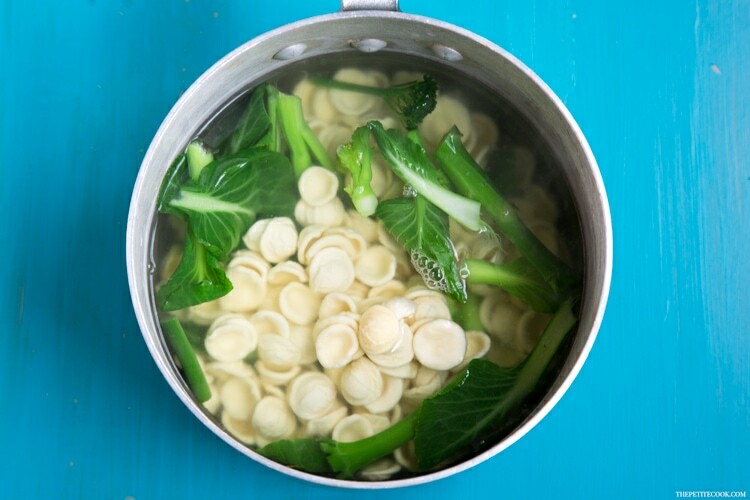 Once the orecchiette and greens are ready, simply drain and fold into the pan. Add in chopped chili and saute’ for a couple of minutes. Et-voila’! Your puglia-inspired orecchiette will be ready without you even noticing. Finish off with grated Parmesan for extra goodness and serve immediately! 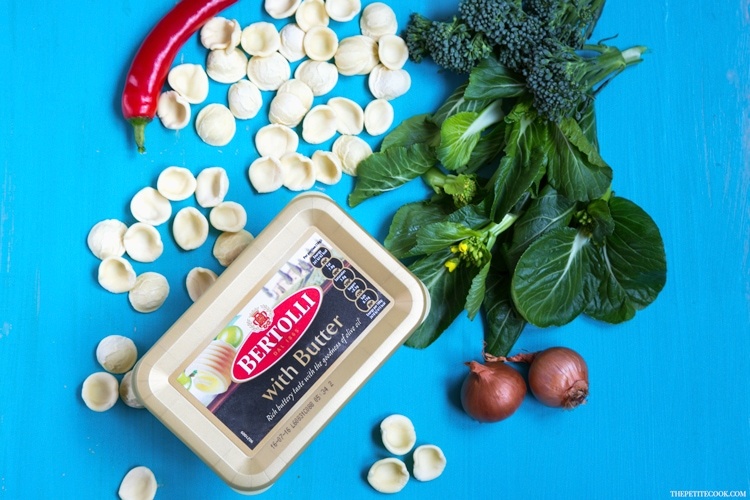 For more cooking inspiration using Bertolli, please visit their page. And don’t forget to follow my foodie trip to Puglia on my Twitter and Instagram. If you have any tips, I want to hear all about them! This delicious 5-Ingredient orecchiette pasta dish is quick and easy to make. A lovely combination of spring greens, traditional Italian pasta and spicy red chili for a healthy vegetarian meal that will blow your taste buds! In a large pot of lightly salted boiling water fold in orecchiette and broccoli. Add choy sum leaves, if using, halfway through cooking time. In the meantime, heat a large pan over medium-low heat. Add in Bertolli with Butter and chopped shallot and cook until soften. Drain pasta and vegetables and fold into the pan. Add in red chili and saute' for a couple of minutes. Remove from the heat sprinkle with freshly grated Parmesan cheese and serve immediately.